The Green Monster at Fenway Park. Creative Commons Attribution-Non Commercial-Share Alike by Robert Godwin. At this time of year things are warming up here in Sydney. Final year school students are doing their leaving exams. Christmas advertising is starting to make an appearance. The jacaranda trees are just starting to show the very first hints of the glorious purple flower spectacle that blankets the city every November and makes it easily the most beautiful month of the entire year. And my thoughts turn to summer sports. Two summer sports in particular. Because as the Australian cricket season begins, on the other side of the broad ocean that laps on my eastern shore, the American Major League Baseball season is culminating in the race for the World Series. Unlike the vast majority of Australians, I have an interest in baseball. The clack of wood on leather, the roar of the crowd, the drama of competition, the graceful displays of athleticism, and the intricacies of the game and the statistics. It all appeals to something in me. I am sure that if I lived in the USA, I would be an avid follower, attending games regularly, watching many others on TV, or listening on the radio while doing other things. But, living where I do, I am restricted to watching the odd game on a Saturday or Sunday morning, which is a Friday or Saturday night game from the east coast of the US. Almost invariably it features either the Yankees or the Red Sox (or both). The TV stations here don’t show any west coast games. During the week, games are on in the morning when I’m at work. I could, I suppose, find US radio stations streaming coverage over the Internet, but by now the disconnect from my daily routine is too great. I do occasionally open up MLB.com‘s GameDay coverage in a window at work to keep tabs on scores, but there are always distractions and other things that need doing at work, so I find that often I open it a the start of a game, then look at it again four or five hours later when the game is over. I even find the architecture of baseball parks fascinating. Like cricket grounds, baseball parks each have their own unique individual flavours and quirks. 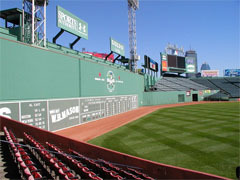 The Green Monster at Fenway Park in Boston. 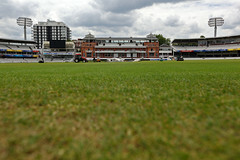 The significant slope across the ground at Lord’s Cricket Ground in London. And the recent trend in retro-classic style ball parks is a great demonstration of how modern architecture can echo the feel of the past, bringing a strong sense of nostalgia, history, and continuity to brand new facilities. And history is a large part of what makes baseball such an intriguing game. The slope at Lord’s Cricket Ground. When I was on a road trip up the coast from San Francisco to Seattle in 2004, one of my stops was in Portland. Naturally I had to stop in at Powell’s City of Books. And I had to buy a book. And it had to be something I couldn’t easily just get a copy of at home. I chose Koppett’s Concise History of Major League Baseball. It was a fascinating read and I learnt a lot of cool things from it. If you really want to understand something in the present day, it’s a good idea to delve into its history, to see how it developed into its current state. I was also struck with several parallels to the history of cricket, with which I am much more familiar. In particular the poor treatment of the players by the wealthy administrators who were running the sport, leading up to rebellions by the players to get fairer treatment. The splits into different leagues of competition, followed by reconciliation. These sorts of things happen for a reason, and the reason comes down to a greedy few and the willingness of others to buck the establishment to get a fair deal. While these ructions are happening, the fans of the sport can tend to see the actions of the people willing to make a fuss as disruptive, but in hindsight, it’s easier to recognise the importance of taking a stand to ensure people aren’t being treated unfairly. And while athletes these days earn a lot of money, this wasn’t always the case. As recently as the late 1970s, when cricket splintered with the World Series Cricket seasons, top-level professional cricket players were severely underpaid and maltreated, and had to sustain regular jobs outside cricket (that tolerated them not showing up for work for two months at a time while on international tours) in order to make enough money to live on. 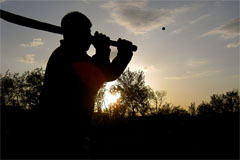 At the time World Series Cricket was seen by many as a disruption, but in the fullness of time it has resulted in cricket being a much stronger sport. 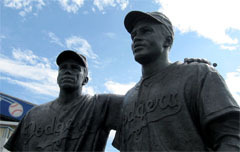 Statue of Jackie Robinson and Peewee Reese. Creative Commons Attribution-Noncommercial by Flickr user Puzzler4879. Both baseball and cricket also had positive roles to play in social issues, particularly racism. In 1947, Jackie Robinson became the first black player in Major League Baseball in the modern era (i.e. since the earliest days of baseball in the 1880s). Supported by Brooklyn Dodgers manager, Branch Rickey, and the Commissioner of Baseball, Happy Chandler, this marked the beginning of the breaking down of racial segregation in baseball. Robinson faced hostility from some opposition teams, but withstood it and let his sporting performances speak for themselves. I won’t pretend to be an expert on the American history of this era, but from my reading it seems clear that Robinson and baseball played at least a contributive and supporting role leading up to the Civil Rights Movement of the 1950s and 60s. Cricket also dealt with and eventually combated racism. As a global sport popular in India, Pakistan, the West Indies, and South Africa, it inevitably became entangled with issues of race, as well as religious and caste discrimination. From 1877, the British colonials in India played an annual cricket match against the Parsis of the Zoroastrian religion (seen as the most “civilised” of the native religions by the Europeans). From 1907, this expanded into a three-way tournament also involving a Hindu team, and then in 1912 a Muslim team joined to form the Bombay Quadrangular tournament, which ran until 1936 in this form, and then to 1945 with the addition of a fifth mixed team, “The Rest”. This tournament saw the breaking of a caste line, similar to Robinson’s breaking of the “colour line” in Major League Baseball, when Palwankar Baloo was chosen to play for the Hindus in 1905. Baloo was a member of the Dalit, or “untouchable” caste, who were at the time normally forbidden from interacting with other members of society through no other reason than being born to Dalit parents. Although a first step towards religious and caste equality, the Bombay Quadrangular was criticised by Mahatma Gandhi in the 1930s for maintaining segregated teams. In the lead up to Indian independence in 1947, the Bombay tournament was disbanded and replaced with a regional cricket competition with religiously mixed teams, providing an improved example for societal integration. 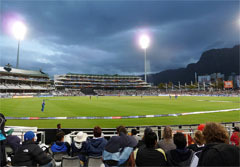 Newlands Cricket Ground, Cape Town. Creative Commons Attribution-Non Commercial-Share Alike by Damien du Toit. More recently, cricket was, by Nelson Mandela‘s own estimation, also a crucial part of the sustained campaign that eventually ended Apartheid in South Africa. South Africa is a sports-mad country, and the boycott of international cricket from 1970 (plus, importantly, rugby from 1984) added substantial social pressure to economic and other sanctions imposed by other countries. Henry Chadwick will be known to many baseball fans as the “Father of Baseball” for his role in popularising baseball in the second half of the 19th century. Chadwick invented the box score format and many of the familiar baseball statistics still used to describe player performances today. Baseball fans might not know that Chadwick was born in England before moving to Brooklyn in 1837, and for the first decade or so of his journalism career he covered cricket matches played in and around New York. He switched to covering baseball in 1857. He invented his baseball statistics by analogy with the well-established cricket statistics with which he was already familiar. It’s this wealth of statistics in both games that lends both the air of slightly nerdy sports. Stereotypically, intellectual nerd types shun sports. Or at least almost all sports. If there’s a sport they like, in the US (and I guess Canada) it’s baseball. Elsewhere, it’s cricket. Kids playing baseball with a cricket bat. Creative Commons Attribution-Non Commercial by Sandor Weisz. Which comes back to the games themselves. For most followers of baseball, cricket seems weird and foreign and complicated. But it’s the same the other way around: for most followers of cricket, baseball seems weird and foreign and complicated. Both games have jargon that sounds arcane if you’re not familiar with it. But if you grow up watching the sport, it all becomes natural. On the complication thing, interestingly the Official Baseball Rules come to a hair under 50,000 words. The Laws of Cricket come to a bit under 27,000 words. This actually matches my relative estimation of the complication of the games, as someone familiar with both sports, though I suspect a bit of the extra verbiage of baseball may be due to American legal verbosity compared to a British “unwritten rules” common-law style approach to documentation. Anyway, the temperatures are warming up, and I’m looking forward to another fantastic summer of cricket. But before that, there’s this little thing called the World Series that I want to have a look at. I remember these days from personal experience. I attended some of the World Series Cricket matches as a kid, just starting to get interested in sport. I’m not sure why people single out some countries as being “sports-mad”. I’ve heard Australia described that way, and the USA, and New Zealand, and the UK. But you could equally well apply “sports-mad” to most European and Latin American countries with football (soccer), to Canada and Russia with ice hockey, and so on around the entire world. I think every country is “sports-mad” to some extent. Not that that’s a bad thing, mind.